Ray Richardson paints in his Woolwich Studio on Thameside not far from where he was born in 1964 and hardly a stone's throw from where is studied at Goldsmiths College of art during that notorious period of the mid eighties that spawned Brit Art. It's something of a surprise then to find a graduate of that school and period producing paintings, drawings and prints worked in the age old mediums of oils and lithograph depicting South East London and it's inhabitants in an almost Hogarthian tradition of observation and wit. 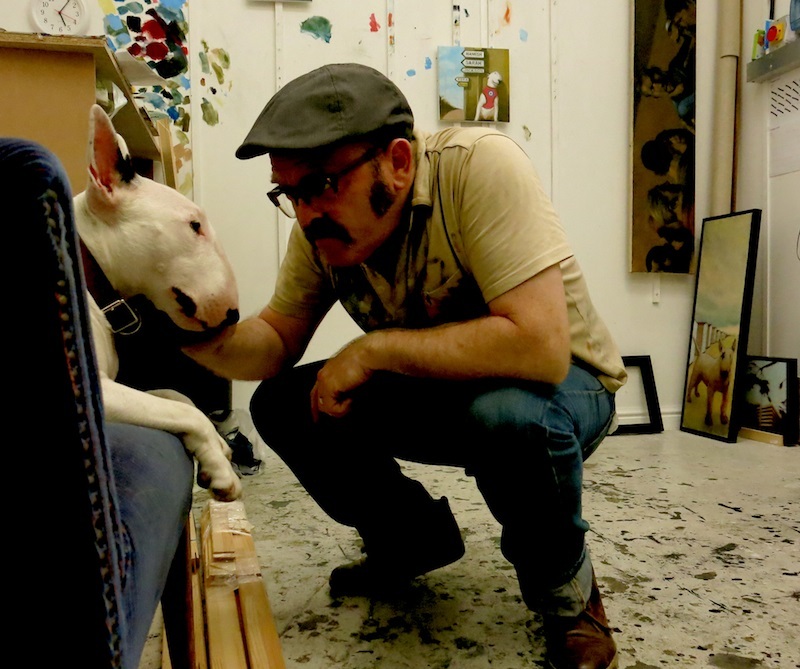 Meetings in pub car parks, streets from dogs eye views, people hanging about and of course Wee Bri Richardson's Bull Terrier and constant companion on his travels around London and beyond are the subjects that take centre stage in his modern life scenes.